How does Oriental Medicine work? Oriental Medicine works by reestablishing balance and harmony within the body. This balance is reestablished by supporting the body’s healthy energy and releasing any unhealthy energy. This system of medicine looks at the body and mind as a whole. An Oriental Medical Practitioner may also look at surroundings, environmental influences, and other external factors that may contribute to balance or unbalance in the body. This balance is reestablished by cooling the body if it is too hot or heating the body if it is too cold. If the body is too wet, drying it out, or if it is too dry, moistening it. If something is too much, lessening it, and if something is too little building it up. If something is stuck, trying to move it and if something is flowing inappropriately, trying to make it flow in the right direction. 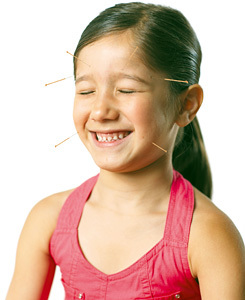 Acupuncture is the placing of needles in specific spots on the body to affect Qi. Qi can be blocked in areas of the body and there can also be excessive amounts of Qi in other areas. The needles help the body to move Qi so that there is even distribution of Qi throughout the body. What is Qi and how does it move? What affects Qi? Qi (pronounced “chee”) is any energy or any force that moves, has direction and can consolidate into physical substance. Qi flows throughout the body, animating and protecting it from illness and disease. The quality, quantity, direction of flow, and balance of Qi influence your health. Qi is directly influenced through acupuncture, herbal medicine, diet, martial arts such as taiiji and qi gong, and life style choices. Qi can disperse and condensate, the same way that water has many forms. Water can become ice and take a solid form and it can become steam and take a gaseous form. Qi is the same way; it can condense into physical form and it can disperse into energy. Just like water, Qi is in a constant state of flux. Depending on the conditions that surround it, depends on what state you find it in. Even ice in its solid state is melting and becoming water again and steam collects, condenses, and becomes water as soon as it hits another surface. Qi is not static, keeping a particular form absolutely. Orientals understood that qi flows through Channels, sometimes called Meridians, in the body. These Channels are analogous to the pipes in a water system or the empty river bed that allows water to flow through. They are the empty space that have the potential for energy to flow through them. The Qi flows in the Channels in a predictable manner, like currents in a waterway. Where a river flows, it transports life-giving water and nutrients that nourish the land. In the case of the Qi, the Channels bring energy and life giving force to your body. There are 14 main Channels that traverse through out the body and are connected to the organs, muscle groups, nerves, and glands. Each Channel has acupuncture points, sites where the Qi can be influenced. Where Qi goes, blood goes. Qi is the motive force for the blood to move. When Qi flows freely throughout the body there are no health issues, no pain. You enjoy good physical, mental and emotional well-being. Any obstruction of Qi in the body is like a dam, backing up the flow of Qi in one area and restricting it in others. Blockages prevent the distribution of the nourishment (the blood) that the body requires to function in optimal balance. What is Chinese pulse palpation? One of the chief methods of diagnosis in Oriental Medicine is through “feeling the pulses.” The practitioner will take the pulse on both wrists. This looks a bit different than taking the pulse from a Western point of view. In Western medicine they are only concerned with how many beats per minute are being generated in the pulse. For Oriental Medicine much more information is gleaned from feeling the pulses. On the thumb side of each wrist is a bone that runs down from the thumb, on the interior side of the wrist. The practitioner will place three fingers along this bone and feel the pulses in three distinct places on each wrist. Each of these places on the wrist correspond to an organ and its accompanying meridian or channel. The practitioner is then able to take the pulse for that particular organ and system, gleaning information on what may be going on in the body as a whole. What is the significance of looking at my tongue? This is another diagnostic method that Oriental Medicine uses to determine diagnosis. The practitioner will look at the tongue and use information such as the color and texture to confirm or disprove the hypothesis they have developed from the pulses and questions. The tongue is the only internal organ that can be viewed. This can give the practitioner a glimpse into what is happening with the other internal organs. How often can I receive acupuncture? Acupuncture is very gentle. You can receive acupuncture treatments daily. For chronic and long lasting conditions, more frequent visits increase effectiveness. At the beginning of treatment the practitioner will recommend coming once a week. However, if you are able, more times in a week will produce quicker results. Once you have achieved your goals with acupuncture, maintaining what you have accomplished is also recommended. For health maintenance many people come once every two weeks or once a month. Ultimately, you need to decide what level of care you are willing to commit to. Different conditions need different amounts of time to see a result. Treatment length varies on how long lasting and severe the condition is. If you have an acute or minor condition that has not been present for very long, usually 3 to 5 sessions will produce a result. More entrenched, chronic diseases usually need 10 or more sessions. If it is a life-long problem it could need maintenance for the rest of your life. Length of treatment also depends on how severe the problem is for you. On a scale of 1 to 10, if a problem rates a 5 or less, you could probably see relief in 3 to 5 sessions. If you rate a problem at 5 or higher, it will probably take 10 or more sessions. For chronic conditions, our practitioner likes to aim for 5 sessions and reevaluation at that time. It is usually evident by the 5th session whether acupuncture is working for you or not. If it is not, our practitioner knows of other practitioners who may be beneficial to you and is happy to recommend. Acupuncture is very safe when practiced by a trained, qualified practitioner. When practiced correctly, there are no side effects and no practitioner caused disease. If a patient reports side effects from a Oriental Medical treatment, the practitioner modifies the treatment until there is healing without side effects. This medicine is about restoring balance to the entire person, not just a piece or part. Side effects mean that there is an imbalance which needs to be corrected. The practitioner works until these imbalances are gone. This also might mean getting other practitioners on board as well to address things that are outside the scope of Oriental Medicine. The initial visit takes roughly an hour and a half. We start with paperwork: initial information, informed consent, and HIPPA signature sheet. Then the practitioner will check your tongue and feel your pulse on both wrists. Both of these observations give indications towards the Chinese diagnosis. Then the practitioner will ask the “Song of the 10 Questions.” He will have a conversation with you in order to glean information about your condition, further leading to the Chinese Diagnosis. After that he will give the first treatment, based on what he has found. Typically he needles in the arms and legs, so wearing clothing that is easy to pull up and expose the skin is advised. Sometimes it is necessary to needle on the back or torso; we have medical gowns for such purposes. What is my Oriental Medical diagnosis and what does it mean? Oriental Medicine has its own system of personalized pattern discrimination, just like Western medicine does. These patterns are professionally recognized groups of signs and symptoms. These signs and symptoms are collected by the practitioner and lead to a diagnosis. The practitioner will feel the pulses, look at the tongue, and ask the “Song of the 10 Questions” to group the symptoms into patterns. Your diagnosis might be Liver Qi Stagnation or Spleen Qi Deficiency depending on the set of symptoms that you presented at the time of diagnosis. These tell the practitioner how to proceed with treatment: what acupuncture points would be best for you as well as what herbs would work the best for your condition. Your diagnosis might change from visit to visit. As the Qi is moved in the body, it adjusts and other things present themselves. What do I do before and after my treatment? Prior to a session it is suggested that you don’t consume any food and just water for 2 hours. However, this is not always possible. Let your practitioner know if you consumed anything in the two hours before being treated. After a session you may feel extremely relaxed. Some people need to take a moment to “land on the earth” before they drive. You will also want to take note of any changes that happen the two days following the session. You will want to let your practitioner know the following week what has occurred. The needles are extremely small. 18 acupuncture needles can fit into the tip of a hypodermic needle, typically the kind used to draw blood from a patient. Our practitioner uses a gentle Japanese style insertion technique, which causes very little pain, if at all. It depends on how sensitive the patient is. Some people report that they can not even feel the needles being inserted; others say that there is a small pinch. How deep do the acupuncture needles go? The needles are inserted from an 1/8 inch to a ½ inch deep. Our practitioner uses a Japanese style technique which does not use deep needle insertion. Some Chinese styles uses much deeper insertion. In most cases deep insertion is not necessary. Very! Acupuncture is about cultivating Qi. Acupuncture can restore balance and flow of Qi if any blockages are found without the use of heavy prescription medications. And the practitioner does not even need to use needles! Children are very responsive to acupressure, herbs, massage, and cupping, none of which are invasive. Acupuncture is a safe, natural, drug free supplement to use with your children for their continued health and well-being. What are the educational & training standards for Acupuncture Physicians and how do they differ from Oriental Medical Practitioners? Medical doctors are able to become licensed acupuncturists by taking 250 hours of classes on point location, meridians, and needle insertion. They are only licensed to perform acupuncture. They approach acupuncture from a point perspective: your Western medical diagnosis says you have diabetes and these particular points are good for diabetes. Oriental Medical Practitioners have to have a previous bachelor’s degree and then complete a four year masters including three years of clinical work. They are licensed for acupuncture as well as herbal prescription. They approach acupuncture from the Oriental Medical diagnosis: by using the diagnostic means, they come up with their diagnosis, which then leads them to treatment options. Acupuncture points that an Oriental Medical Practitioner might use will probably be vastly different than that of a Western medical practitioner. The goal of the Oriental Medical Practitioner is to treat the underlying condition, not the stated condition. And from an Eastern perspective there could be several reasons that a person ends up with a symptom such as diabetes: kidney yin deficiency or dry-heat in stomach and intestines. Cupping therapy is used to mobilize blood flow to create healing. In Oriental medicine it is typically used to dispel stagnation in a particular area of the body. The practitioner takes a small rounded glass cup, wipes the inside of the glass with alcohol, and then lights the alcohol on fire. Once the flame is extinguished (it usually only burns for a second) the cup is then quickly placed over an area of the skin, typically the back. The air inside the cup expands when it is heated. When the air begins to cool, it contracts and draws the skin slightly into the cup, creating suction. Drawing up the skin is believed to open up the skin’s pores, which helps to stimulate the flow of blood, balances and realigns the flow of qi, breaks up obstructions, and creates an avenue for toxins to be drawn out of the body. This invigorates the blood, bringing new blood to the area and dispels the stagnation. Stagnation in an area can create sensations of pain. Cupping can be administered with stationary cups or with moving cups, depending on the situation and the location of the stagnation. With moving cupping, oil is applied to the skin and the cup is slid along the surface of the skin without detaching suction. The sensation is very similar to deep tissue massage. Cupping can sometimes leave bruising or marks on the skin, depending on how long the cups are left on the skin and how deep the suction achieved. In “wet” cupping, the skin is punctured before treatment. When the cup is applied and the skin is drawn up, a small amount of blood may flow from the puncture site, which is believed to help the body remove harmful substances and toxins. Gua Sha is an East Asian healing technique. Gua means to ‘scrape or rub.’ Sha is a ‘reddish, elevated, millet-like skin rash’ (aka petechiae). Sha is the term used to describe Blood stasis in the subcutaneous tissue before and after it is raised as petechiae. Gua Sha is one technique that intentionally raises Sha rash or petechiae. Gua Sha can be used whenever a patient has pain, whether associated with an acute or chronic disorder. There may be aching, tenderness and/or a knotty feeling in the muscles. Palpation reveals Sha when normal finger pressure on a patient’s skin causes blanching that is slow to fade. In addition to resolving musculo skeletal pain, Gua Sha is used in alleviating symptoms of the common cold and flu, as well as any chronic disorder involving pain, which is considered in Oriental medicine to be the congestion of Qi and Blood. Sha is raised primarily at the Yang surface of the body: the back, neck, shoulders, buttocks, and limbs. The area to be Gua Sha-ed is lubricated with oil. The skin is then rubbed with a round-edged instrument in downward strokes. One area is stroked until the petechiae that surface are completely raised. If there is no Blood stasis the petechiae will not form and the skin will only turn pink. A ceramic Chinese soup spoon is what our practitioner uses for the instrument. The color of the Sha is both diagnostic and prognostic. Very light colored Sha can indicate deficiency of Blood. If the Sha is fresh red, it indicates recent penetration. If the Sha is purple or black, the Blood stasis is long-standing. If brown, the Blood may be dry. Dark red Sha can indicate heat. The Sha should fade in 2-4 days. If it is slower to fade, indicating poor Blood circulation, the practitioner must ascertain whether it is deficiency of Blood, Qi or Yang, a deeper stagnation, or organ deficiency at the root. In most cases the patient feels an immediate shift in their condition, particularly in their pain or sense of constraint. Gua Sha moves stuck Qi and Blood, releases the exterior by mimicking sweating, and moves fluids. Gua Sha promotes circulation and is a valuable treatment for both external and internal pain. Moxabustion or moxa burning employs lighted herbal cones or sticks that are inserted on top of acupuncture needles (or held over specific channel points) to infuse heat and Qi into specific body areas for tonification. Moxa is also used to expel Cold in order to disperse Blood stagnation or is used to help regulate menstrual cycles when trying to conceive. This particular office does not send insurance forms at this time. However, some forms of insurance do cover acupuncture. We are more than happy to supply you the forms and codes to submit to your insurance company if you wish to be reimbursed for treatments. We do accept the health reimbursement account cards, however. They can be run just like a credit card. What are the laws governing acupuncture in Pennsylvania? (i) The stimulation of certain points on or near the surface of the body by the insertion of needles to prevent or alleviate the perception of pain or to normalize physiological functions, including pain control, for the treatment of certain diseases or dysfunctions of the body. (ii) The term also includes the use of supplemental techniques. Acupuncture educational program—Training and instruction in acupuncture or supplemental acupuncture techniques offered by a degree-granting institution authorized by the Department of Education that leads to a master’s degree, master’s level certificate or diploma or first professional degree, that meets the relevant and appropriate requirements of 22 Pa. Code (relating to education) and 24 Pa.C.S. Chapter 65 (relating to private colleges, universities and seminaries) and that meets or exceeds the standards required for acupuncture or Oriental medicine programs established by an accrediting agency recognized by the United States Department of Education. Acupuncture examination—An examination offered or recognized by the Board to test whether an individual has accumulated sufficient academic knowledge with respect to the practice of acupuncture and herbal therapy to qualify for the privilege of practicing as an acupuncturist or as a practitioner of Oriental medicine. The Board recognizes the NCCAOM component examinations in acupuncture and sterilization procedures as the examination for registration as an acupuncturist and the NCCAOM examination component in Chinese herbology as the examination for registration as a practitioner of Oriental medicine. Acupuncture medical program—An academic or clinical program of study in acupuncture which has been given category I continuing medical education credit by an institution accredited or recognized by the Accreditation Council on Continuing Medical Education to conduct category I continuing medical education courses. Acupuncturist—An individual registered to practice acupuncture by the Board. Chinese herbology—The study of the use of herbs in the Oriental medicine tradition. Herbal therapy—The application of Chinese herbology to the treatment of acupuncture patients. NCCAOM—The National Certification Commission for Acupuncture and Oriental Medicine. Practitioner of Oriental medicine—An acupuncturist who is registered by the Board to use herbal therapy. Supplemental techniques—The use of traditional and modern Oriental therapeutics, heat therapy, moxibustion, electrical and low level laser stimulation, acupressure and other forms of massage, herbal therapy and counseling that includes the therapeutic use of foods and supplements and lifestyle modifications. The provisions of this § 18.11 amended under section 3 of the Acupuncture Registration Act (63 P. S. § 1803); and section 8 of the Medical Practice Act of 1985 (63 P. S. § 422.8). The provisions of this § 18.11 adopted January 2, 1987, effective immediately and applies retroactively to December 31, 1986, 17 Pa.B. 24; amended May 19, 1989, effective May 20, 1989, 19 Pa.B. 2161; amended April 13, 2007, effective April 14, 2007, 37 Pa.B. 1644. Immediately preceding text appears at serial pages (222904) to (222905). § 18.15a. Scope of practice of acupuncturists and practitioners of Oriental medicine. (a) An acupuncturist may practice acupuncture and use supplemental techniques but may not use herbal therapy. (b) A practitioner of Oriental medicine may practice acupuncture and use supplemental techniques including herbal therapy. (c) This subsection does not limit the scope of practice of a medical doctor who is registered as an acupuncturist. The provisions of this § 18.15a issued under section 3 of the Acupuncture Registration Act (63 P. S. § 1803). The provisions of this § 18.15a adopted April 13, 2007, effective April 14, 2007, 37 Pa.B. 1644. What are the clinical applications of Chinese herbology? Nutritional education is stressed to assist patients in choosing foods for the body’s nurishment and optimum health, as well as for treatment of disease. Foods have many similar properites to herbs. Teas and Soups are water-based herbal formulas traditionally prepared from raw or processed herbal ingredients. These are traditionally ingested for the treatment of internal and external disorders of both acute and chronic natures. Tinctures and Wines are both alcohol-based herbal formulas prepared from raw herbs that are used similarly to teas and soups. Wines are traditionally applied externally to alleviate pain, or ingested as a tonic, depending on the specific formula and the disease being treated. Oils, Balms, and Liniments are oil-based herbal formulas usually applied externally for the treatment of muscle, tendon, and ligament trauma, to alleviate pain, disperse Excess Qi, or to draw Qi into specific areas for tonification. Compresses, Powders, and Pills consist of herbs that have been pulverized into a paste, powder, or poultice and are then applied externally for the treatment of acute or chronic injuries. They can also be ingested for internal organ tonification and the rebalancing of the body’s energy system. Pills are herbs specially prepared from traditional formulas, rolled into little balls, and orally ingested for the treatment of Internal disorders. Does someone have to take herbs and receive acupuncture at the same time? Chinese herbology and the acupuncture are mutually exclusive. Someone can receive acupuncture without taking the herbs and vice versa. However, administering both at the same time potentiates the effect of both. Our practitioner is willing to do them separately or together. An initial appointment is needed for either tract. There is a lot of concern about the safety of Chinese herbs due to some bad press by the media. If sourced correctly, herbs are very safe. As with anything, if you get it from a questionable dealer the quality will be questionable. We get our herbs from Taiwan. We have several suppliers that operate ISO 9001:2000 inspected facilities and are GMP plants. Part of the concern with Chinese herbs is species identification. These plants have a four part system of species identification: appearance, microscopic identification, chemical identification including color chromatography and spectrometric analysis, and chemical fingerprinting, which identically matches a batch of herbs to a laboratory standard. In addition to correct identification these plants test for pesticide residue, heavy metal, sulfur dioxide residue, and aflatoxin. All herbs are certified to be free of these compounds. If you want company specific information you may want to visit the companys’ websites or you can come in to view the materials we have on their facilities and procedures. When available we try to acquire wildcrafted, organic, or sustainably harvested herbs. Kasier Pharmaceutical (KPC)– We purchase their brand of herbal granules for our pharmacy. We are able to encapsulate these herbs as well. These herbs are pharmaceutical and practitioner grade. Herbal Times from Nuherbs Company – We purchase their brand of tea pills, the small round black pills that are compacted herbal balls. These are pharmaceutical and practitioner grade. Golden Flower Chinese Herbs – We carry select varieties of their formulaic herbs in capsules. These are pharmaceutical and practitioner grade. Spring Wind and Dr. Kang’s Herbs – Our raw herbs are sourced from these two suppliers, depending on which herbs are available when. Spring Wind carries many organics and wildcrafts. Both companies sell most of their herbs only to practitioners. Dragon Herbs – These are retail grade herbs from Ron Teeguarden, a master herbalist. Asian patents – We have a small selection of Asian patent formulas which are cold and flu remedies and topical applications. What is the difference between Western and Eastern herbalism? Western herbalism primarily treats single or separate symptoms such as headache, insomnia, constipation, etc. Western herbalism would lead you to take echinacea for colds, ginkgo for memory, or St. John’s Wort for mild depression. One herb or a small group of herbs is used for each symptom, somewhat like Western drugs. Chinese herbalism bases itself on diagnosing you as a whole picture: formulas are unique based partly on your symptoms, but also on emotional temperament, cause, duration of disease, and your overall body constitution. So, three people with a headache may be diagnosed three different ways and take three very different formulas. About 25% of Western herbs are found in the Chinese pharmacoepia, they are just used differently. What is the difference between tonic and medicinal herbalism? Tonic herbs are safe to consume regularly over long periods of time. The Chinese refer to these type of herbs as superior herbs since they are prized and promote longevity, beauty, and vitality. It is preferred to prevent disease rather than try to fix it in the Chinese cosmology. There are roughly 120 herbs in this category. Medicinal herbs are used for shorter periods of time and should only be administered under a physicians care. They are used for specific reasons and not general health promotion. While some tonic herbs are used in medicinal formulas as well, they are used differently medicinally. How many herbs are in the Chinese pharmacopeia? There are 530 common herbs in the Chinese Materia Medica, with many more that are more rarely used or no longer available. In our pharmacy we carry 230 of the individual herbs and 64 of the pre-mixed formulas. Myofascial practitioners work with releasing painful muscle and fascial movement. Myofascial restrictions occur from trauma, surgery, and inflammatory processes throughout the body. These myofascial restrictions can produce pressures of approximately 2000 pounds per square inch on pain sensitive structures that do not show up on any standard tests such as MRIs or x-rays. This enormous pressure acts like a “straightjacket” on muscles, nerves, blood vessels, and osseous structures producing the symptoms of pain, headaches, and restriction of motion and disease. Myofascial Release allows the chronic inflammatory response to resolve and eradicates the enormous pressure exerted on pain sensitive structures by myofascial restrictions to alleviate symptoms and allow the body’s natural healing capacity to function properly. Water is essential for life and Myofascial Release works with the water relationship in the body. Fascia and proteins in the body, when properly hydrated, act as semiconductors of energy. Any communication in the body relies on water. A 10% change in water content can trigger a million fold change in charge transportation along a protein. Trauma and inflammatory processes dehydrate the fluid component of the fascial system and this inhibits the vital communication that flows through the liquidity of the fascial system and every cell of our body, ultimately producing pain. When these tissues are released, fluid can again flow and proper communication is restored. Myofascial Release was developed by John F. Barnes, a physical therapist from Pennsylvania. He began working with the fascia in an intuitive way and discovered the techniques he teaches today. Electro-dermal screening is a galvanized skin response that measures the electrical resistance on the skin’s surface. The purpose is to detect energy imbalances along invisible lines of the body described by acupuncturists as meridians. The testing device sends a tiny electrical current, too small to be detected by the patient, through a probe. The patient may hold a probe in one hand, while a second probe is touched to another part of the body. This completes a low-voltage electrical circuit, and a computer screen or a needle on a gauge reads out a number between 0 and 100. This may be repeated at many different places on the skin. These numbers are used to decide if the patient’s energy is out of balance. If the patient is being tested for a type of treatment, samples of various remedies may be tried as the probe is touched to the problem area. Remedies may include homeopathic liquids and dietary or vitamin supplements. Different substances are tested until one is found that “balances” the energy disturbance. Here is a description of electro-dermal screening and what it can be used for by Dr. William LaValley. What is the history of Electro-dermal Screening? Electrodermal screening has its earliest roots in what was called galvanic skin testing. The galvanic skin response, a method of measuring the electrical resistance of the skin, was discovered in the early 1900s. Galvanic skin testing detects sweat on the skin, and more sweat produces better electrical conduction. In the 1950s, a West German physician and acupuncturist named Reinhold Voll combined acupuncture theory with galvanic skin response technology. He tested the skin along various points with particular attention to the acupuncture meridians. Galvanic skin response changes are still used in lie detector tests, along with several other measures such as pulse, breathing, and blood pressure. Are there possible problems or complications with Electro-dermal Screening? Electrodermal screening itself is relatively safe, although people with implanted pacemakers should avoid electrical current. Let the practitioner know if you have a pacemaker.